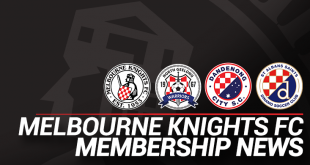 With numerous talking points after the Melbourne Knights’ victory over Moreland, squad depth is the catch phrase within the Knights camp going forward. Along with the performances of Chris Talajic and Brandon Zezvoski, recent additions in Kayne Vincent and Adam Nakic will bolster the ranks, giving coach Andrew Marth greater options as they look to improve on their good form. Returning to the Knights side for his second stint on the weekend, rejoining from Indian side Prayag United, Vincent showed flashes of what he can provide to the Knights side, with good work off the ball creating openings for his teammates and himself. In one instance in the second half, the Kiwi striker’s ability to closely control the ball under pressure and create space in the box with his change of pace and direction, went narrowly unrewarded, as his attempt to beat Griffin McMaster curled just outside the post. Vincent, in tandem with Jake Nakic, with the added depth of Jacob Colosimo, Talajic and Zezovski, will no doubt look to cause headaches to VPL defences in the coming weeks. The 23-year-old is confident that he’ll even further affect the course of matches, with match fitness. “It’s been about two months since my last game, so it’s good to start playing again, and I’m looking forward to helping the boys out in the second half of the season,” he said after the game. Adam Nakic on the other hand, will look to force his way into a seemingly settled Knights defence. Nakic, however, eagerly anticipates the challenge. “It’s a great time to come into the side. Now avoiding the relegation zone, it means that I’m going to be fighting for my spot. They’re playing well at the moment, and I’m enjoying my time,” Nakic said. “Marth has welcomed me from day one. He’s a good coach, obviously with the results he’s brought, but when I get my chance, I get my chance. Captain Adam Zilic commented after the game on the duo’s arrival to the Knights’ squad, and what it means to the in-form side going into the second half of the season. “They fit in perfectly with what we’ve got here at the moment. Kayne was obviously here last year and knows the boys, and Adam will be a very good asset to the team,” Zilic said. This Sunday, the Knights will hope to win their third on the trot, and third at home this season, against league-leading Dandenong Thunder. Kick off at Knights Stadium, in what is an intriguing match-up after Dandenong’s hard-fought 2-0 win in their previous encounter, is at 3 p.m.